So I decided last week that instead of spending lots of money to learn to knit Continental (w/ yarn in the left hand), I'd teach myself. I was sitting at Knitting Club watching a friend knit continentally and I thought, "Gosh. I taught myself to knit English (w/ yarn in the right hand), I bet I could teach myself to knit Continental." Ok. I admit. it's harder to retrain my hands than I thought. Attempt 1: I tried just wrapping my yarn around my left forefinger. Failure. I couldn't keep my tension right nor could I even keep the yarn on my finger. It kept sliding off and I think it took me 20 minutes to knit one row. Ugh. Attempt 2: I wrapped the yarn around my ring finger like I do when I knit English. Similar problems. The yarn doesn't want to stay on my fingers! I'm much better at maintaining gauge but it's still not flowing quite right. Estimated time to knit one row was reduced by 1/2. Whew! "Maybe," I thought, "just maybe, I'm on the right track." People say this way is supposed to reduce pain in the wrist and be faster. I was finding it to be a pain in the neck. (BTW, the picture is not me knitting...these are just examples of the correct way...obviously I found this after my many failed attempts). Eventually, after 3 inches of knitting Continental, it finally started to move along at a clip that I was happy with. I truly felt like I was making progress. "Now, I'm ready for purling!" Wrong! Repeat Attempts 1 and 2 above plus add about 50 more and you can guess the state of my sanity! I felt like I'd just been through the ringer and I certainly didn't come out the victor! Twisted stitches. Dropped stitches. Tight stitches. Loose stitches. You name it, I did it. It was grueling. It was frustrating. It was mind-boggling. How can this yarn make me go so crazy?!?! It's just yarn! Every mistake I made I could hear failure knocking at my door. But I refused to give up and after 3 days of intense self-torment, I think I've finally got it down. Well, at least I can purl a whole row! Maybe I'll just fork out the money and save what's left of my brain! Comment below and share your frustrating knitting experiences...who knows, someone may read yours and know the solution! I'm Continental knitter, and in my opinion it's easier and faster to knit that way. 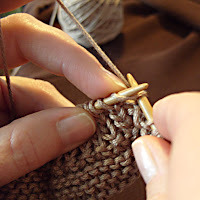 I learned to knit as a little girl, and took me about month to get use to it with needles, stitches, yarn tension.... Even with Continental knitting you can get different type of knit. I didn't know that until I saw lady who is combining Eastern continental and German style. You should see that.... looks absolutly perfect. I just taught myself a couple of weeks ago and it took a bit to get it right but now I am knitting 2X faster than I was before. I found videos on youtube to watch so I could see the actions and I just kept practicing and all of the sudden it just clicked. I had to watch several different people do it before one of them fit me tho! I hear you, Mommieof4munchkins, on needing to experiment with different styles. I'm finally able to transition easily between knitting and purling in continental. I'll have to say, I am knitting faster as well. Still working on my tension a bit but otherwise doing much better!